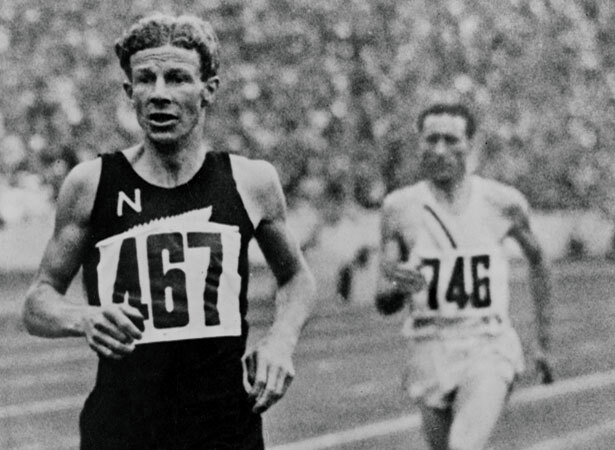 Jack Lovelock won New Zealand’s first Olympic athletics gold medal at the 1936 Berlin Olympics in a race witnessed by 120,000 spectators – including Adolf Hitler. Before the games, Lovelock contemplated competing in the 5000 m instead of the 1500 m. It seems that team manager Arthur Porritt made the final choice. The field for the 1500-m final included many of the top middle-distance runners against whom Lovelock had competed over the years. He ran a smart race, positioning himself inside the American Glenn Cunningham. As they approached the final lap, Swede Eric Ny was leading. When Lovelock surged to his shoulder, Cunningham followed. With 300 m to go, Lovelock accelerated. Lovelock’s dramatic surge famously caused the BBC radio commentator, 1924 sprint gold-medallist Harold Abrahams, to forget his broadcasting etiquette: ‘My God, he’s done it! Jack! Come on! … He wins! He’s won! Hooray!’ Lovelock’s time of 3 minutes 47.8 seconds broke the world record for the 1500 m and made the 4-minute mile seem a real possibility (another 109 m run at the same pace would have resulted in a 4:04 mile). We have 8 biographies, 7 articles, related to Lovelock wins 1500-m gold at Berlin .